This kit is designed with smaller track & hardware for RV's, Yachts, Coaches, etc. and includes Custom Pneumatic opener integrated with track, Liftmaster MyQ wireless controls, 100 feet of air tubing, 12 VDC control box, 12 VDC Transformer, compressor fitting, and mounting hardware. 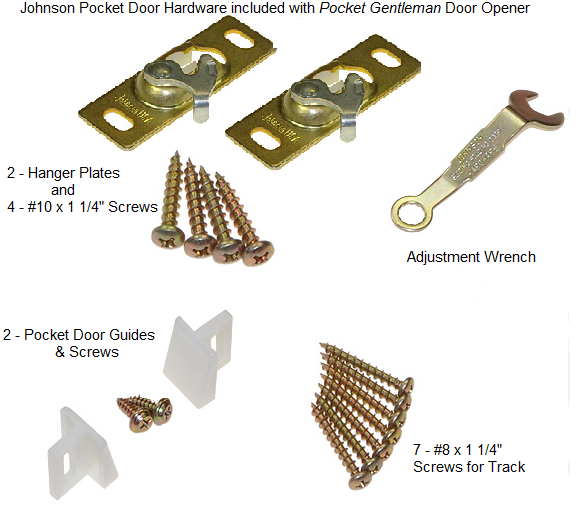 Johnson Hardware includes HD ball bearing hangers rated for a 150 lb. door! Please call with special requests for your installation or questions. Air compressor not included, order separately if needed. The Compact Pocket Gentleman is a pneumatic system designed to power a pocket door. Excellent for narrow installations including luxury yachts, exotic recreational vehicles, or a custom motor coach! Many luxury motor coaches already have an on-board air system making installation even easier! For narrow walls, the track system is compact! The new construction/renovation kit is hidden in the wall and includes the track and hangers for the pocket door. The control system powers the door and is able to sense an obstacle and relax pressure automatically, making for safe operation. The door functions as normal when used manually, but you won't want to move it manually ever again! The pneumatic tubing and the remote system are all plug and play. You receive a wireless remote system or you may adapt to your existing system. It only takes a simple switch to interface with the Compact Pocket Gentleman! You will need a source of compressed air to operate the Pocket Gentleman. Although quiet models are desired, many customers locate the air compressor in a garage or basement up to 125 feet away. If you already have a source of compressed air, you may use it to power the Compact Pocket Gentleman. Additional tubing and connectors are available, please call. Also, add a total of 5" to the overall rough opening width, see instructions. Any questions, please call. Imagine the fascination your friends will experience activating your luxury pocket doors!